Living on the 3rd floor of an apartment house as a kid I never had a pedal car. Crazy as it may sound I did have a giant Schwinn Bicycle that my mother dragged up and down the six flights of stairs. It also had about 30 pounds of extra equipment - saddle bags, streamers, lights, horn. In fact the only pedal cars I remember as a kid were the ones that were made from the wheels of baby carriages, but let's not get into how the wheels were obtained. Lastly the other close pedal car was the old wooden crate with the 2 X 4's for a steering wheel and roller skates attached. Several years ago the famous Petersen Museum in Los Angeles, California had a fantastic exhibit of pedal cars through the decades. Even one of the Oscar Meyer Weiner Mobile pedal car. It was an original miniature version of the cars that have toured the United States and Canada since the 1930's promoting Oscar Meyer hot dogs and cold cuts. The original driver of the car in the 1930's was a little person, who went on to fame in the movie the Wizard of Oz. He was the original Chef Oscar. Pedal cars started just before the turn of the 20th Century. It is difficult to determine if it was because children had requested such vehicles or part of the concept in society that even though little - children should dress as adults and also have many objects that adults employ such as a car. The first cars were crude images of an auto - made of metal bodies, but usually with wooden chassis and wooden wheels with hard rubber tires. Some companies provided extras to the car as the years went on as a marketing tool. Oil cans, turn signals, rubber tires, etc. Even cars began to be employed as an advertising vehicle for the companies. An oil company that I have written on in the past located in California, Washington and Oregon had a pedal car designed in the 1930's. The Gilmore Oil Company founded by Earl Gilmore traveled up and down visiting all his gas stations from the spring - fall in a touring circus. He drove a convertible and one of the lion cubs rode on the seat. 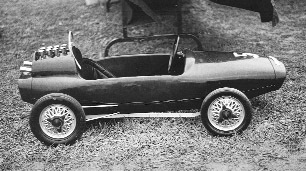 The Gilmore pedal car was manufactured by the Gendron Company of Toledo, Ohio. The Gendron Company was founded in 1872 and went on to make pedal cars until the start of World War II. During World War II the company manufactured hospital equipment such as wheeled stretchers, wheel chairs. The Gilmore “Special” has a lion leaping on the side of the car. Gilmore Oil Company material is some of the most valuable in the petro collecting area. Gilmore stations only existed in California, Washington and Oregon. Many of the companies such as Murray, Garton, Gendron and Austin of the United Kingdom were involved in some manner of parts for “real size cars”, so it was natural to move into smaller kid vehicles. Pedal car companies included; Garton, Gendron, American National, Toledo Wheel, Murray and an up market brand of Steelcraft manufactured in Cleveland, Ohio and AMF. Pedal cars have gone through cycles of the types manufactured, material used. Most of the cars of the 1930's Depression were purchased by families that still had wealth. The cars were not affordable for the average family. The Garton Toy Company was located in Sheboygan, Wisconsin. My old experience with one of their pedal cars was in my younger years when I visited the local barber. Besides having barber pole outside the shop, he had a 1930s Pontiac which had been made for use in barber shops. Many barber shops had a 1929 Cadillac manufactured by Steelcraft as a barber chair. The barber chair cars sell for thousands on today’s market. The time period of the late 1920s to 1940 saw an increase in not pedal cars, but pedal airplanes. It would seem that after Charles Lindberg's famous solo flight to Paris - kids wanted to fly the skies. In 1929 American National manufactured an airplane. Single wing, but the engine was the only type seen in pictures - many cowlings. While World War II was just over the horizon in 1939, Murray came out with a Pursuit aircraft. It had two wheels under a wing and a tail wheel to keep the car or was it plane stable. It was based on the famous Pursuit plane of the United States Army Corps. the P-26. The P-26 would be destroyed in 1941 in the Japanese attack for it was a plane whose day had passed, but in 1939 it lived as a brightly colored pedal plane. Murray would lead the way with a new aircraft after World War II. In fact, it would take a youngster to the edge of space and beyond. In 1954 Murray had the 1st space car. The space car had as the ad described it; “Dyna chain drive, with full ball bearings, motor tone when the space shift lever was employed, realistic dual jet controls - created was a pedaling machine.” It was 45" long and had awing span of 25" and on its fin was a nuclear symbol. One of the more interesting companies and well represented in Canada was the Austin Pedal Cars manufactured by the Austin Motor Company Limited. Two models were available the Junior Forty (J40) and the pathfinder. The Junior Forty was based on the 1948 A40 Devon and Dorset. The Pathfinder Special was based on the Jameison OHV 750 Austin Seven racing car of the late 1930's. The cars were manufactured in a special plant in Bargoed, South Wales. There have been two stories about the employees of the plant - one that each was a disabled Welsh coal miner and the other that workers had been disabled in World War II. The reality was that the workers were disabled and 250 were employed at the plant and the Austin Company operated it as a non-profit company. The J40 Roadster is 5' 3" long and 2' 3 1/2" wide and stands l' 10". The Pathfinder Special is a little taller due to it being a race car with a high back - 2' 2 1/2". The cars were sold in stores and schools purchased and employed the cars in their teaching of street safety. The other main market and one where many are still observed is the carnival roundabouts and many at one time could be driven for a coin at the local supermarket. The 1950s saw cheaper pedal cars and more kids parents were able to purchase one. The most common are the red fire engines made by Murray which also manufactured a boat pedal car. Television had an impact on one car, the old Saturday matinee show that starred Roy Rogers and his wife Dale, Bullet the Dog, also had a sidekick Pat Brady that drove an old jeep Nellybelle. Any that remembers the show knows that the running joke every week was how the door on the driver's side refused to close. At the height of the popularity of the show a pedal jeep was manufactured and sold. In the 1954 Sears Christmas catalog - a Garton chain drive Kidillac Deluxe was featured, “battery powdered headlights and taillights” for $36.95. The same car was given away by selected Cadillac dealers when pop or mom purchased a new “real” Cadillac. Anyone wanting to look at pages of pedal cars just has to pickup an old Christmas catalog. The 1965 Montgomery Ward catalog has several pages of pedal cars, tractors, fire engines, army cars and even a Model T. The prices were reasonable and affordable, but a little big to put a pedal car under the Christmas tree. Even Marx the famous toy maker of plastic items came out with a Zoom Pedal Car . Into the 1960s the metal cars gave way to plastic. Companies began to employ cars for contests - one unique one is the Planters Peanut Car which was a prize for various contests. My youngest had a Good Humor Pedal Ice Cream Truck. It came with plastic ice cream on a stick and even plastic coins to teach kids about money. The vehicle had a slot to drop the money into and to top it all off was a Good Humor hat. Pedal cars are being made today - many with the old tooling, but once again as in the Depression - not cheaply. So if a cheap, inexpensive pedal car for your child is your goal - the Canadian Reliable Toy Company of Toronto still manufacture the bright orange farm tractor pedal car for a very reasonable price. Why even a trailer to haul farm manure can be purchased. According to a company spokesperson it is the most sold item of Reliable after being in business for almost 80 years.